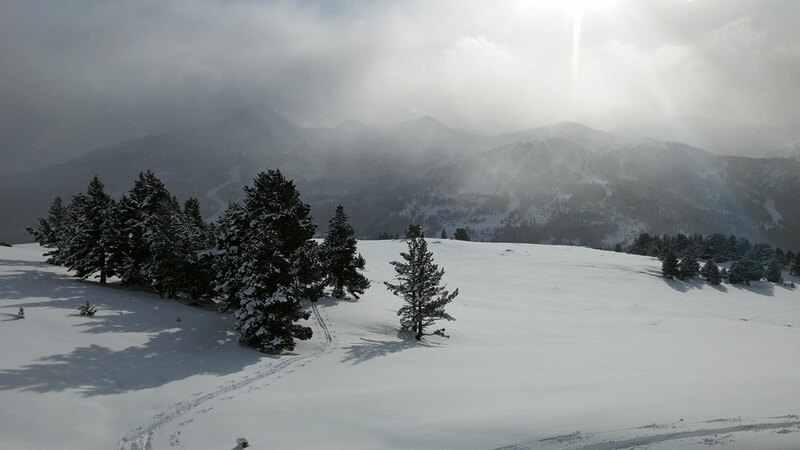 February is, generally, a good month for snow fall but the question is where will it fall? And when? Not necessarily overnight or in your backyard, that's for sure. Sometimes you need a road trip or two to chase the pow. We drove back from Austria, yesterday - a seven and a half hour trip. We're now working on features inspired by three days on the SIGB Ski Test in Kuhtai talking to the ski brands, distributors and agents who were showing over 900 skis for winter 2015/16. 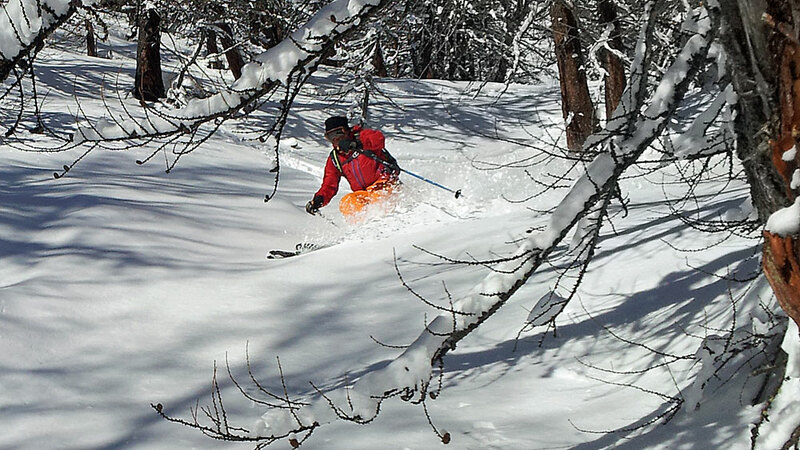 We had two days of snow and one of sun so we could try skis in powder and piste. For some of the media and retail testers, the exhibition area was like The Pits in Formula 1, as they came through to change skis and do another lap. Graham Bell said he managed to test 19 skis on one day. The final day ended with an Atomic sponsored 150m team relay race up the fairly steep slope of the T-bar lift on touring skis followed by speedy removal of skins and descent through some chopped up powder beside the drag. The fastest was the La Sportiva team on super lightweight Scarpa race skis that weighed less than a ski pole (and were not much fatter). Gavin was in a team of three with Alain Baxter (who had never been on touring kit, though was pretty good coming down) and, SIGB organiser, Mike Jardine, who, to save time at the top, did an epic descent with heels free and skins still on. 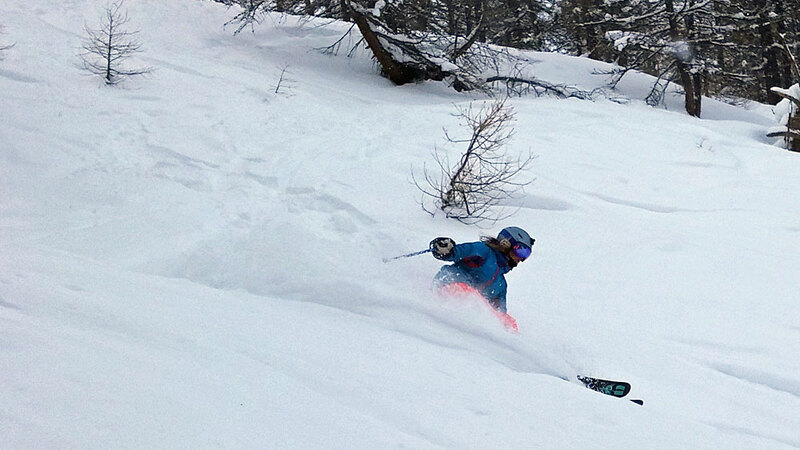 There was no lie in, yesterday, on a powder day. We were up to catch the 08.30 lift from Frejus (only this early during the half term holidays). BUT.the Casse du Boeuf didn't open until 09,00 because of piste patrol avalanche detonating up the hill. So there was a bit of a queue but we were still up the hill among the first to score the 35cms or so of fresh from Saturday. 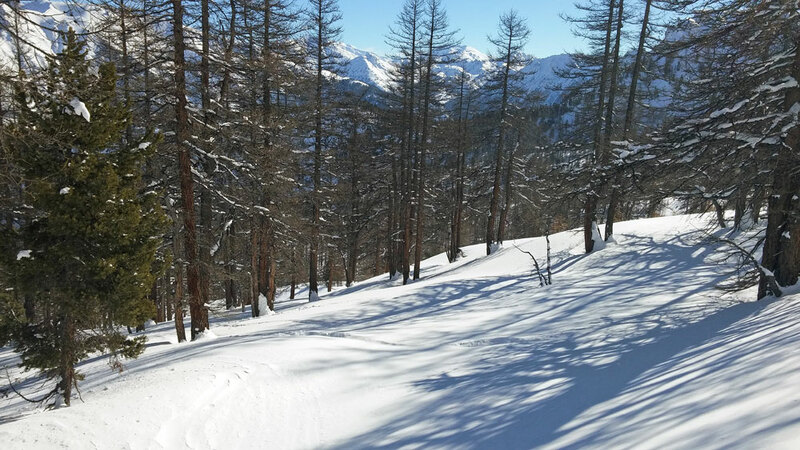 A few runs through the trees and then up Vallon to do a high traverse line and then sublime first tracks through the trees and down to Frejus village and back to the chair for another lap. Better than a poke in the eye with a sharp stick - which is what I received from a low hanging twig in the woods! SUNDAY, 22nd FEBRUARY, 08.00 -2C GOOD MORNING! Cloud and some breeze. Up for first lifts at 08.30 to make the most of the fresh before everyone trashes it. Yesterday, while it snowed all day, it was great in the trees. Goggle tans are developing nicely. The sun has shone on the half term holiday crowds - and the snow's coming tomorrow just in time for their homewaard bound journey! 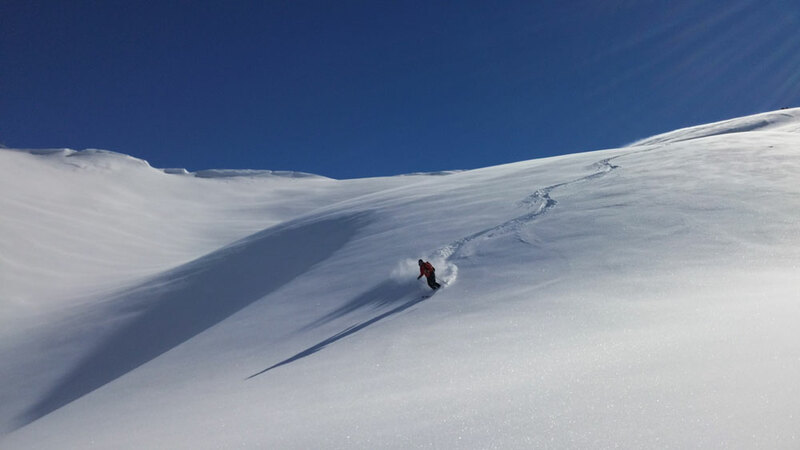 The guys were still in Val Maira, yesterday, enjoying touring up over1000m and coming down untracked powder. And they had it all to themselves! Colder start but the mercury is rising. Snow's beginning to melt at 1200m. And it's sun till Saturday which is good news for everyone on half term. Then looks like some snow on Saturday and more early next week. 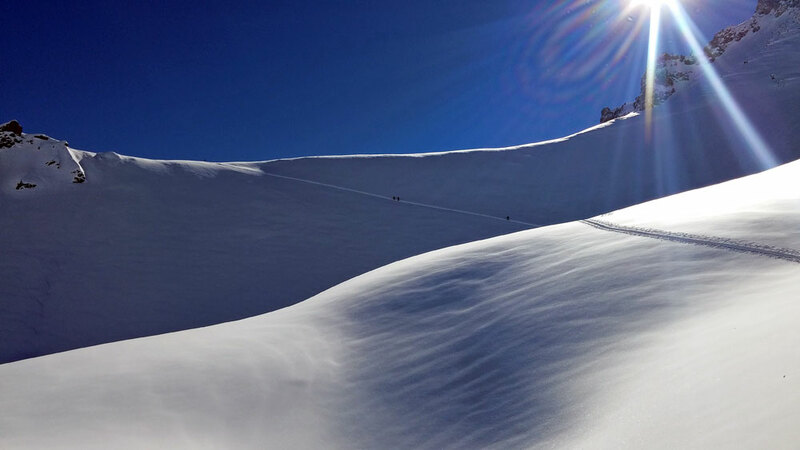 The guys had another great day in Val Maira - superb scenery and snow sublime. They've been joined by two more Swedish guides who have rocked up (live in Chamonix), not with clients, but purely to suss the place out for future trips - and probably to get away from the hordes. Another sunshine holiday week. What more could a resort - and the mountain restaurants - wish for? 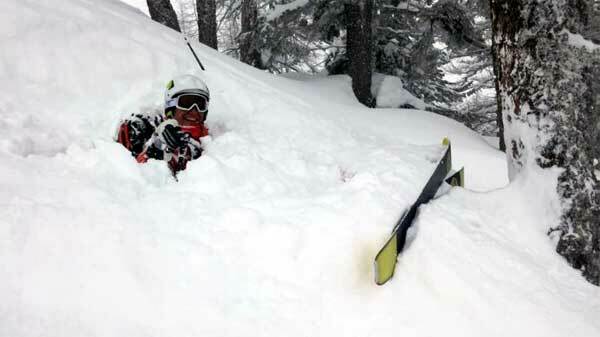 We, however, could wish for another couple of metres of snow! Meanwhile, the guys are still on their road trip in Italy. They've moved on from the place that shall remain nameless to Val Maira where they did a 1000m day tour. 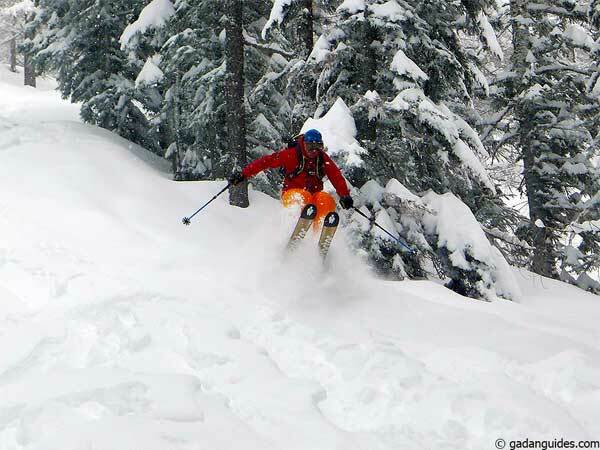 Here they found loads of untracked powder, safe gradients and trees. They, also, have a guide, airbags, transeivers and rescue kit. Looks like a sunny week ahead for half term. Snow forecast again for Saturday, which will be another transfer day mayhem to look forward to! 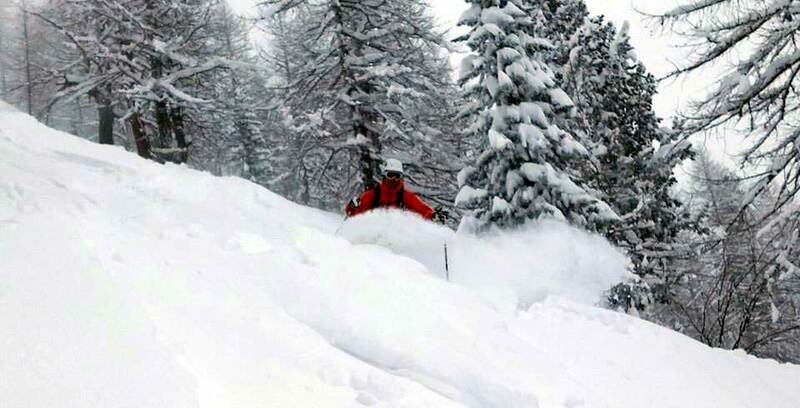 Actually this is Italy and knee deep powder. And it's a secret spot among locals and guides where you hardly ever see clients! I could tell you where it is but then I'd have to kill you all. 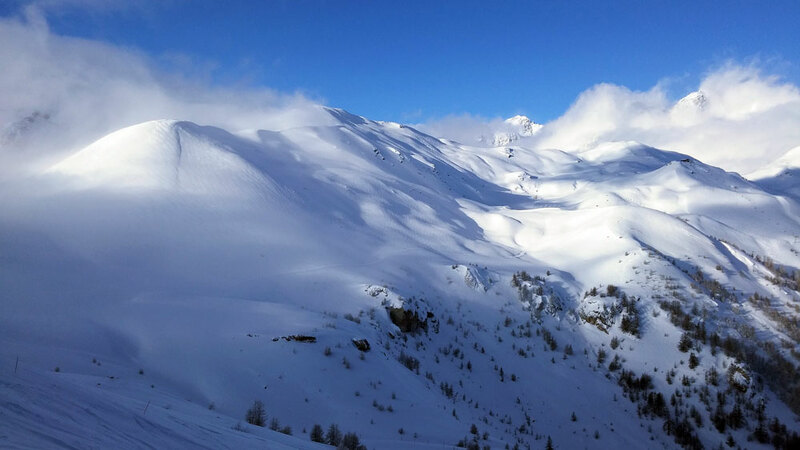 And, finally at around 10.15, the Eychauda drag opened so we could do the Cret de Serre Chevalier (the ridge pictured, below) before any first tracks. 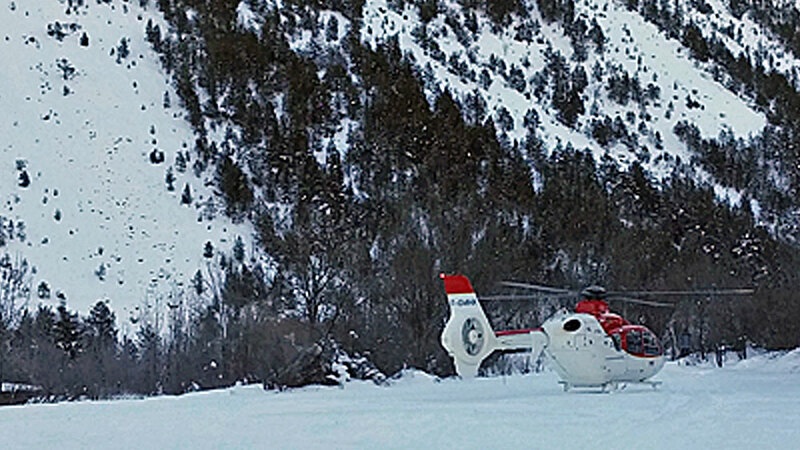 And, yes, we were carrying airbags and full avy rescue kit, which is more than most of the other off-piste warriors were! SATURDAY, 14th FEBRUARY, 09.00 SNOWING! It started snowing last night but there was only a dusting, this morning. But now more is coming down and it looks like it's going to continue through the weekend to Monday. Happy transfer day! Meanwhile, yesterday, was avoiding the holiday punter hordes, Day 5. 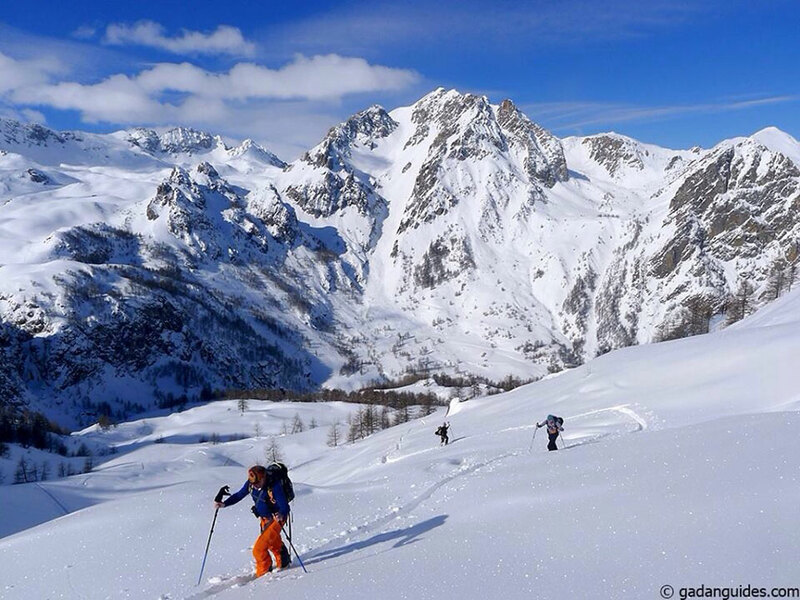 So we went totally backcountry with the Rando Chiens (Jack Russells) and ski toured over in the Nevache valley up towards Chalets de Granon and then on up through Bois de Granon. It was a 9K round trip with a 900m skin up with a stop in Caro, a deserted summer mountain village, for a break. We saw all of three people. The descent was sublime in widely spaced trees and, mostly, in cold snow. Rando Chiens are now having a lie in! The cam is temporarily out of order. Bear with. Meanwhile, if you viewed it, yesterday, then it's the same today! Another blue sky day. And getting warmer! 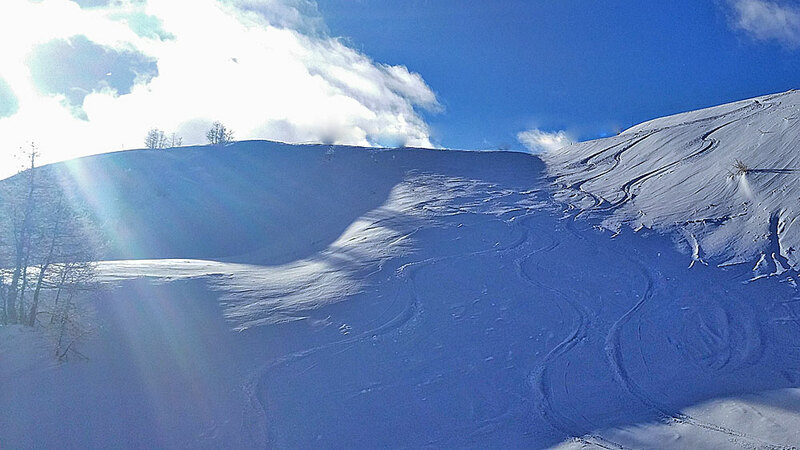 So perfect on the pistes for the French holiday hordes. 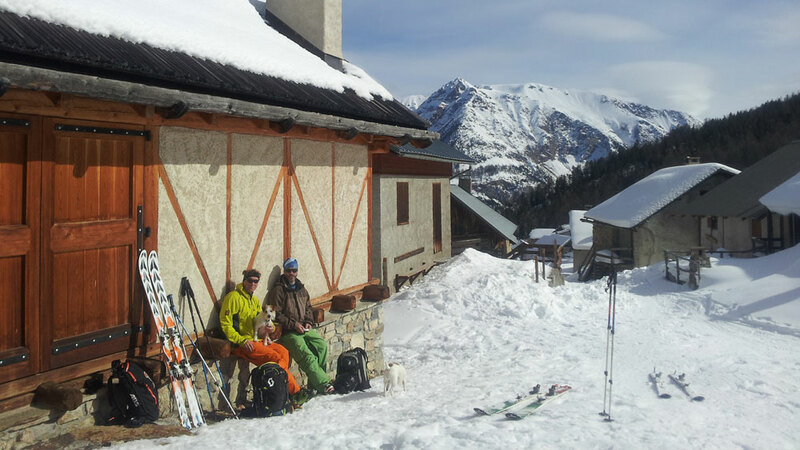 And mobbed in the mountain restaurants, this lunch time - sharpen your elbows for the best (sunny) spot on the terraces. 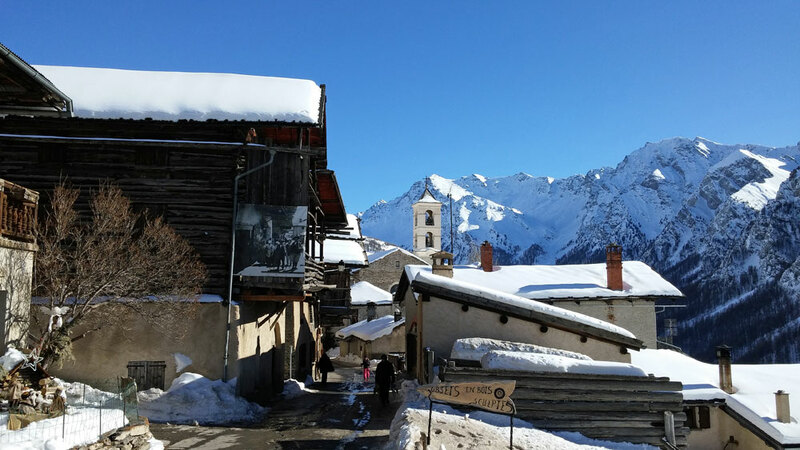 Yesterday, we were avoiding holiday crowds; this time on a road trip down to the Queyras, Molines St Veran (highest commune in Europe and not a modern building in sight). 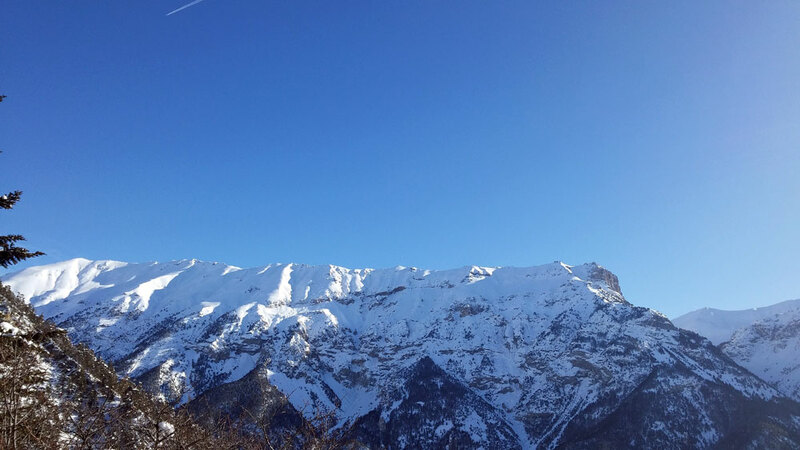 It's a very special place, great for off-piste and touring; although the off-piste is majorly tracked out and heavy in the rising temperatures during the day and the touring is, currently, too dangerous. 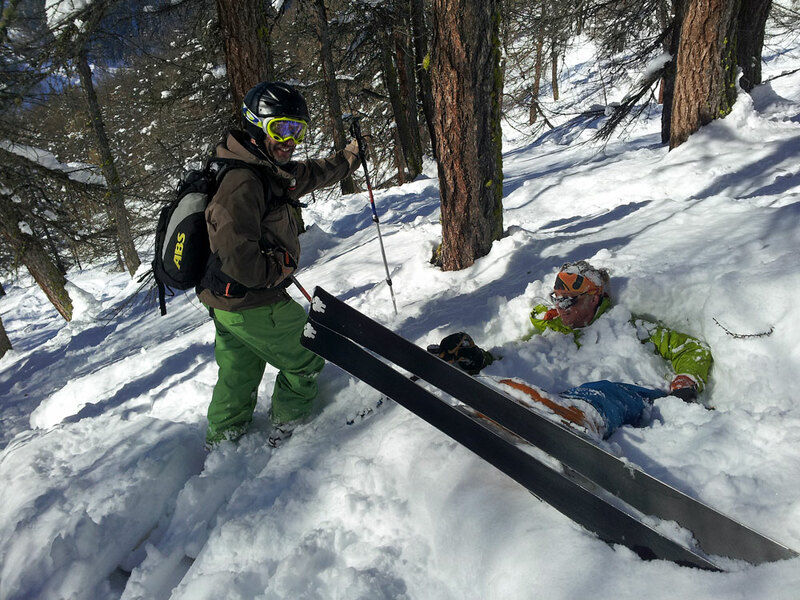 But the lift pass is only €26 and, from 14th March to 6th April, there's a 50% reduction, so we will be back! Yesterday I went down to the Club Alpine Briancon to see if they had a ski tour plan for today, and on the notice board was 'meet at 08:30 ski tour Bois de Granon above the Val Claree near Nevache'. So I thought that was a good option and safe. Arrived there at 08:30 to see the Club van with a group of kids and a few others and I thought this is a strange ski tour group, and not one that I really want to be part of, as I could see the pace being SLOW. So it emerged that this group was going to La Grave and that, as no one had signed up for the ski tour, it was cancelled! So I opted to drive to Val des Prés anyway. As I neared the parking the road was closed at the avalanche barrier just out of the village though I did see a few cars coming through, obviously locals. Maybe they did not want tourists going further up the valley? 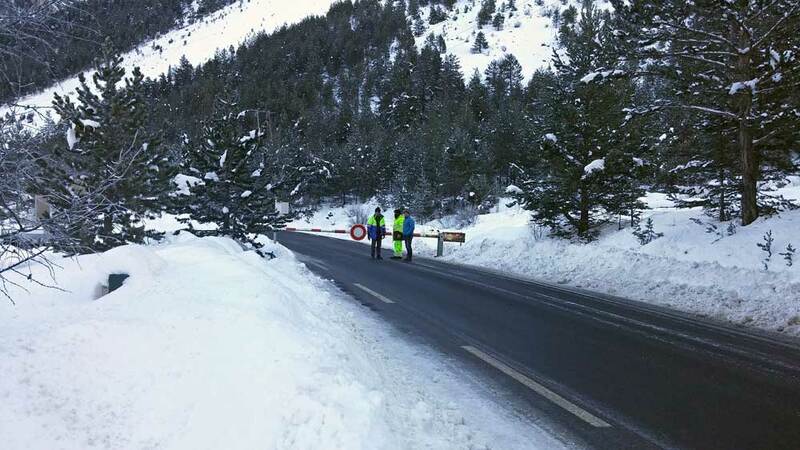 So out with the skis and skins and another van turned up coming from the direction of the closed road and the driver had a chat with the guys at the barrier. He was obviously a local as his number plate was from the region. He started off skinning up just before me, and as we went off the road into a field there was a helicopter which took off just as I went past. Around 10 minutes later I heard the sound of explosions and sure enough the heli was lobbing charges on to the various faces along the ridge in the photo, below. and in one instance set off a massive slide. Only trouble we were in the trees and could not get a good photo. The slides went down to the valley floor and over the road, hence it was closed and would also explain the heavy snow ploughs on the scene. 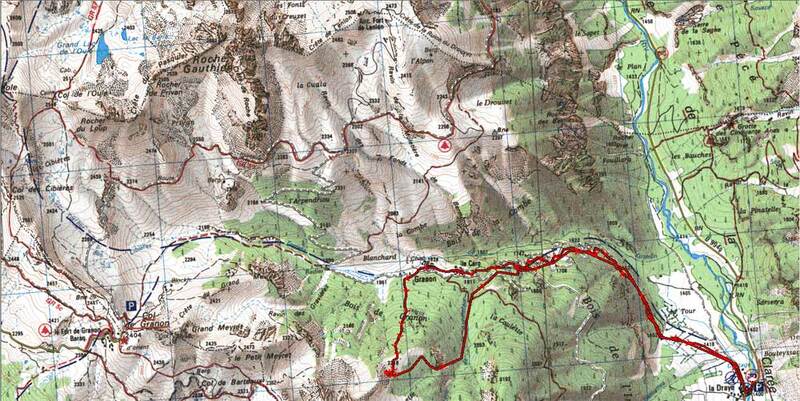 This is a known area in the spring to avalanche and. today. was preventative. I have to say what a great job doing that on a Sunday morning! So I caught up with the French local in front and sure enough he was from the village of Plampinet further up the valley. So I tagged along with him, only trouble he was going at a hell of a pace. 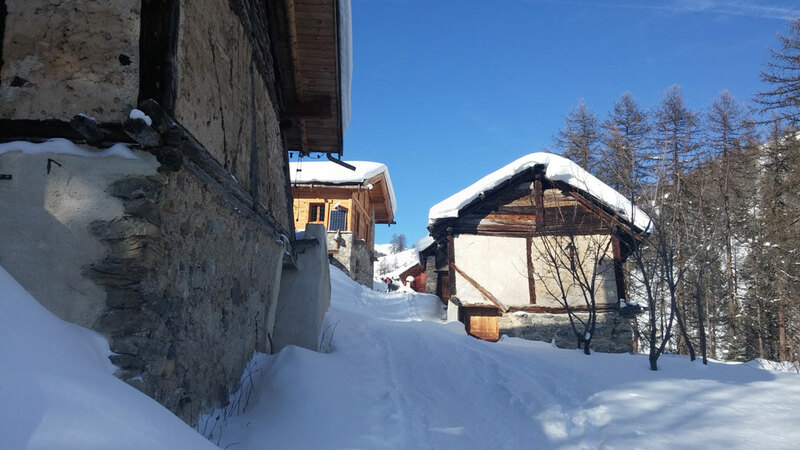 If I'd been on my own I would have taken the more obvious route once past the summer hamlet of Granon which was picture postcard beautiful with snow covered old summer village chalets and the usual chapel. Instead he turned off into the trees and I duly followed with my HR at times in the mid 170s! There was a skinning track that he was following so I didn't feel too guilty about him making fresh tracks up front. He did stop for a rest once or twice thankfully as I was close to fading. Where we were going up, the trees were superb being widely spaced and light powder between them with hardly any obstacles. As we started to come out of the trees I did see a face that I thought I'd leave it to him and stopped as it looked too suspect - and it was good that he too called it a day there. We had a break and I gave him some English gateau to eat (Soren Malt loaf) and then we got into descent mode and it was tree skiing at its very very best. He was very neat in his skiing, a wee bit old school maybe but I'm being overtly critical, and I'm sure if we'd encountered crust etc he would have easily out skied me. 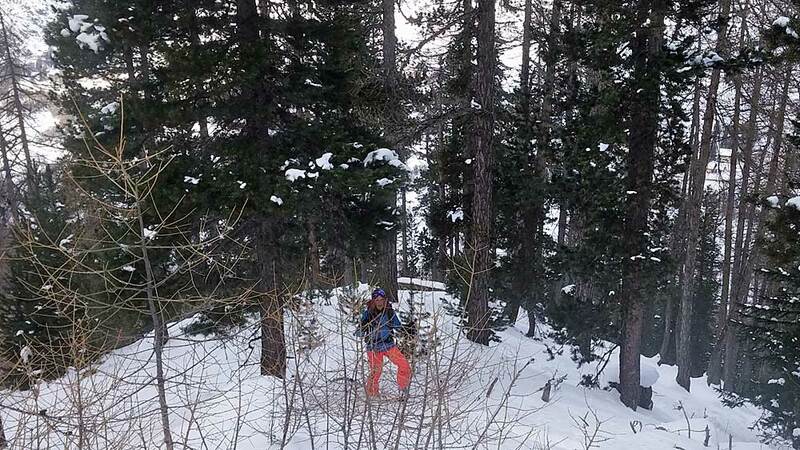 We took it in turns to navigate down until we could ski the trees no longer and joined the path we came up. 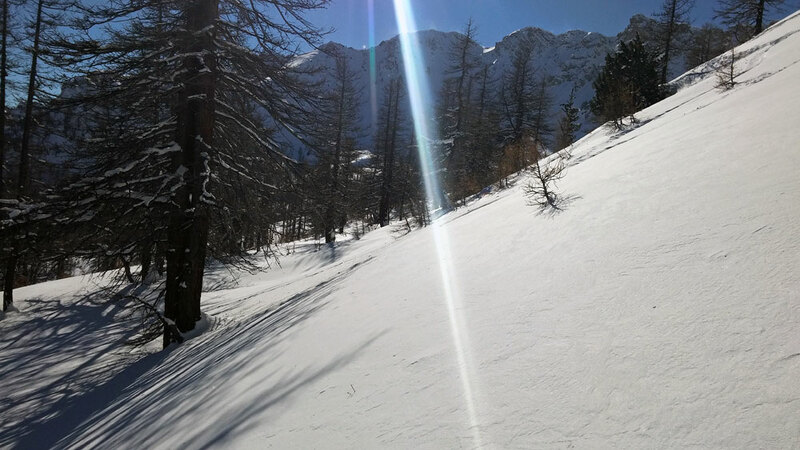 So we had around 500m of descent of great tree skiing and 400m of going back down the chemin, but it was well worth it and I'll be back. Once back down we exchanged pleasantries and I took his email as I'd taken some photos and he suggesed we stay in contact to ski together at the weekend, so the Brit must have been doing something right! 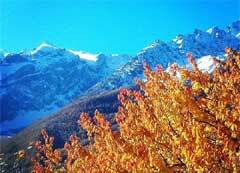 A few cms yesterday but not as much as elsewhere in the Southern Alps. The Queyras has had over 2m. But we made the most of the fresh and what's left in the trees. 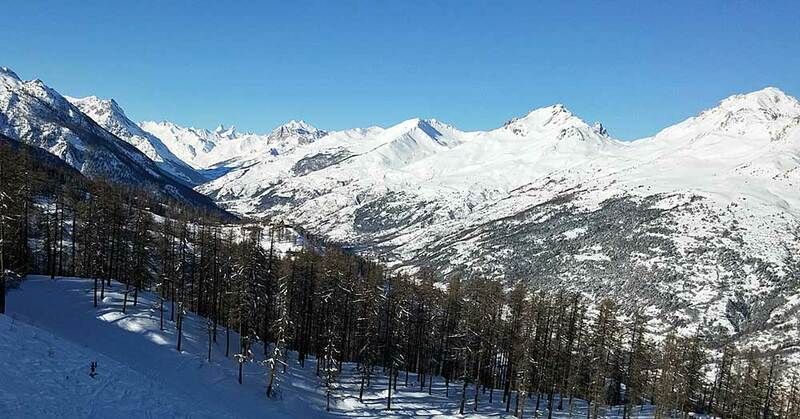 Waiting to see just how much it'll snow today, while the Italian resorts just over the border from us in the Southern Alps such as Sestriere look like they might be getting the lion's share. 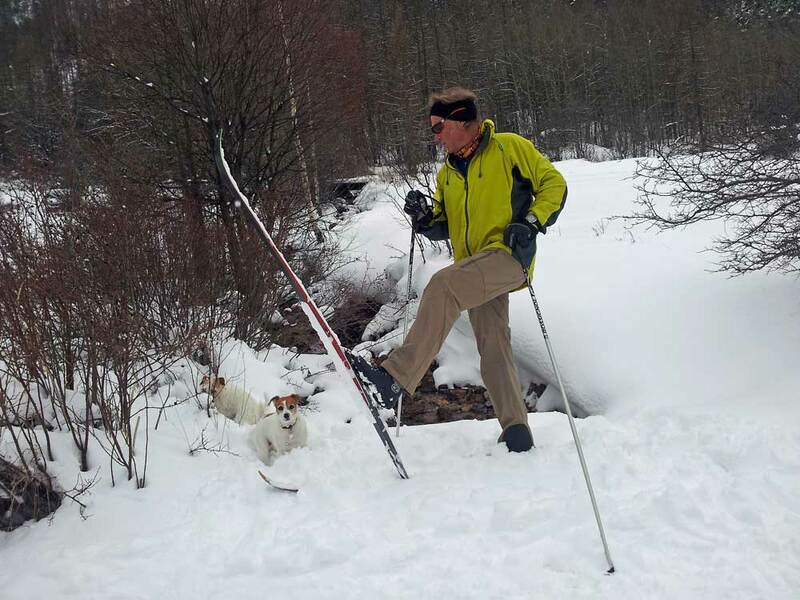 We took the X country skis out, yesterday, for a 7K ski with the Rando Chiens. Unfortunately, the X country area has not yet been pisted here in Serre Che so it was quite hard work to go at any speed. 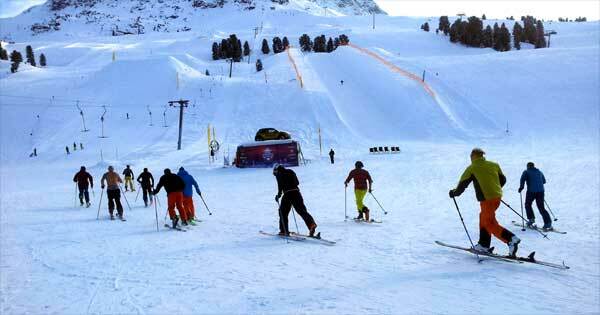 But it's very good for balance, staying upright on matchstick width skis! Looks like we might miss out on the storm that's coming from the south and dumping on the Italian side of the Alps just across the border from us. 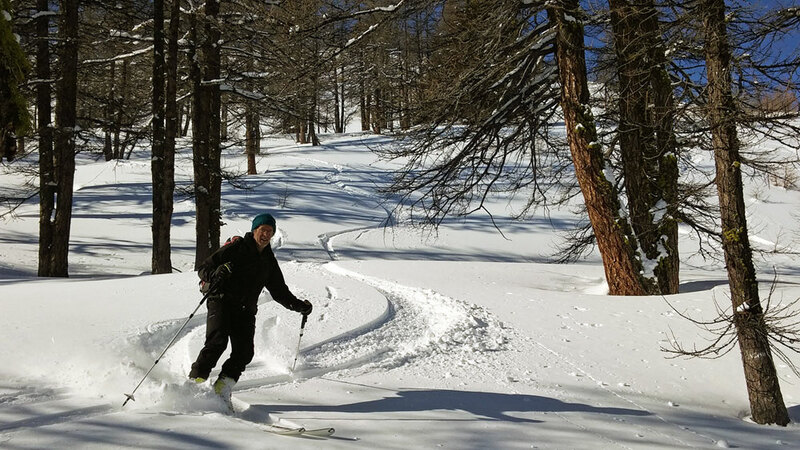 Yesterday, we went for a backcountry ski tour in the Bois Noir woods above Nevache as it was a safe option. The only issue was not knowing the route and Gav having to navigate the best way up, even though there is actually a randonnee drag lift obviously only used at odd, unpublicised times. Going up was steep and powder with roots underneath so the kick turns were challenging. Well, for me. Coming down was 50 percent combat skiing avoiding rock, roots and low branches - and waiting for the Rando Chiens so they didn't take the wrong turn. All down safe and sound. Cold morning. Again. Making the most of our thermals, this year! Some snow is due later and over the next couple of days, but nothing major. Alas! 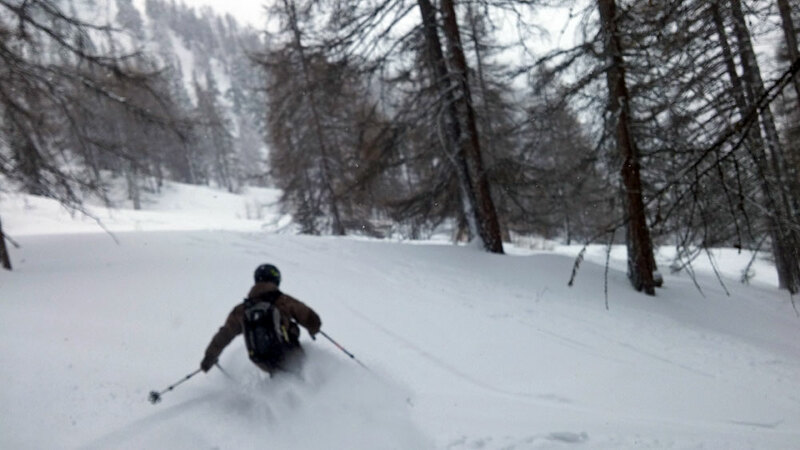 Yesterday, we rode hard and fast on the pistes, which are in very good condition thanks to last week's snow, top up from the cannons and cold temperatures. 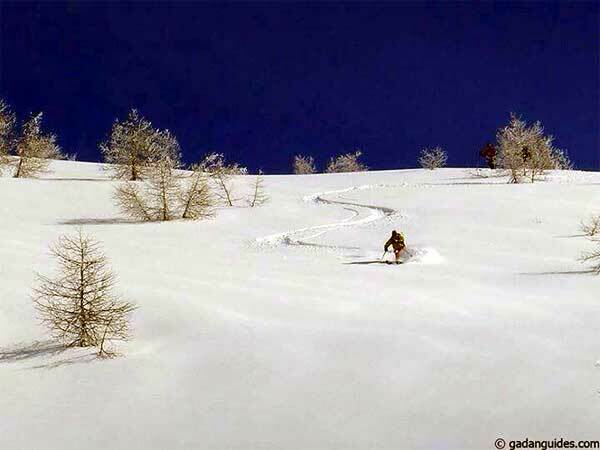 All the off-piste has been completely tracked by the weekend warriors - we did the steep chopped powder under the Clot Gaulthier more as a test of legs than for pleasure. We ended up on the Aiguillette (pic below) over at Chantemerle, which was still closed from the weekend but, pah, it hadn't stopped people going down and trashing the powder. Huge mounds of cannoned snow are everywhere, obviously waiting to be pisted for the half term holiday mob arrivng from next week over February. It stopped snowing after midday yesterday. 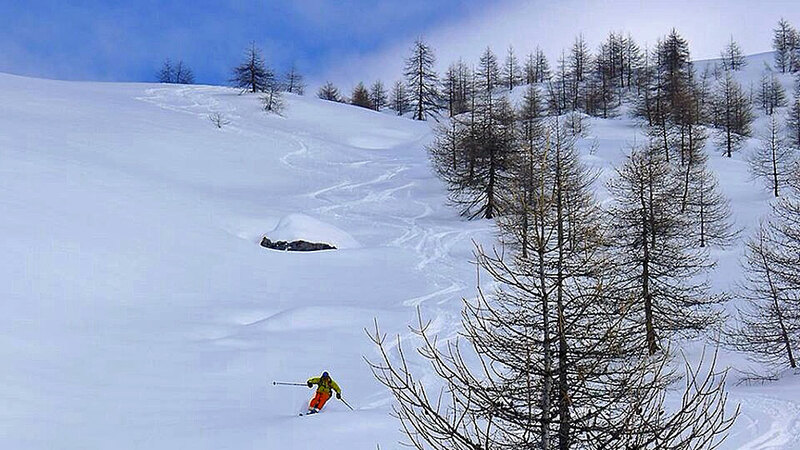 Gavin opted for a quick ski tour up from Le Villard Late just above Chantemerle on the South facing slope (Col de Granon road). 'I boot-packed the first 200m vertical carrying skis on my SCOTT Alpride airbag, as if you skin up the road it takes ages so it's better to hike up the foot path though it is hard work! Lovely powder but, as I suspected, not too deep, hence I was not using my best touring skis. Only did around 500m as it was getting late in the day, plus I'd left water and grub back on kitchen table. I was quite lucky with the weather as the sun decided to come out making for some picture postcard scenes. That's Luc Alphond piste in the back ground.